Demonstration for surf rescue work. Caption slip reads: "Photographer: Gaze. Date: 1953-12-07. Reporter: Gaze. Assignment: Venice Helicopter rescues. 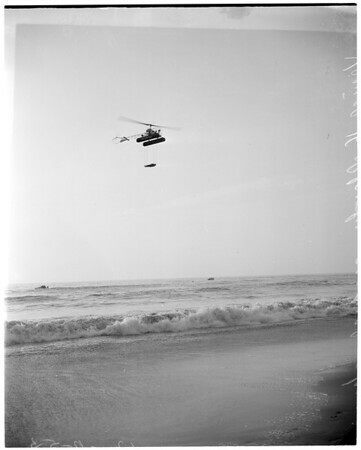 11: 'Drowning victim' is carried ashore in wire stretcher suspended by helicopter in demonstration of use of 'copter for surf rescue work. 46: Same as above, pix taken from ocean. 12: Helicopter hauls two 'victims', actually Venice lifeguards, to 'safety' as they cling to a life preserver at end of tow line."